Mayor Stephanie Rawlings-Blake on Sunday lifted Baltimore’s citywide curfew, effective immediately. The curfew, as originally ordered, was scheduled to last through Tuesday morning. The lift comes after several days of peaceful protests across the city, reports Ryan Sharrow in the Baltimore Business Journal. Businesses across city, standing to lose thousands of dollars due to closing early, also appealed for an end to the curfew. Gov. 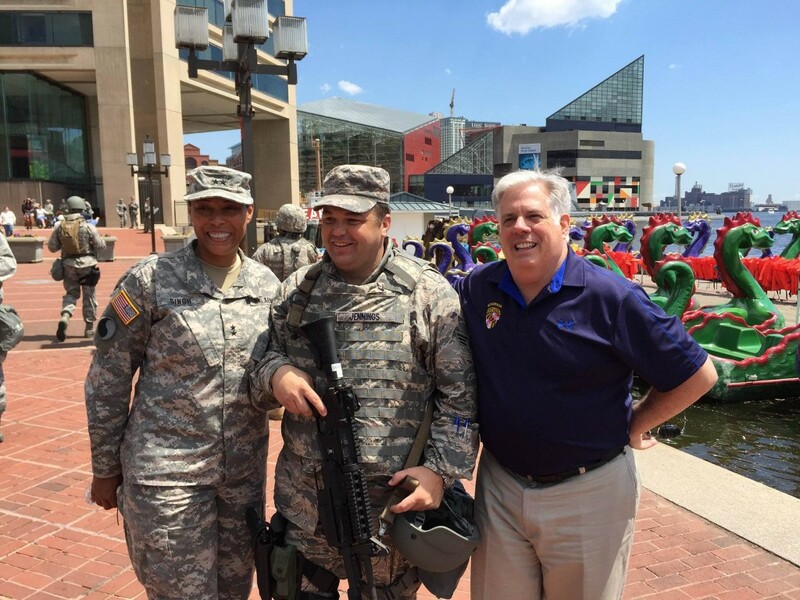 Larry Hogan says the Maryland National Guard has begun demobilizing the 3,000 troops brought into Baltimore after rioting broke out last week, a process that will take about three days. Hogan said Sunday that the state of emergency won’t be lifted until the last of the National Guard has left. He says he and Mayor Stephanie Rawlings-Blake spoke and they agree that it is time to get the community back to normal again. He says lifting the curfew is a good idea, according to WBAL-AM and the Associated Press. Senate Minority Leader J.B. Jennings, center, a member of the Air National Guard, shown here with Adjutant General Linda Singh and Gov. Larry Hogan on patrol in the Inner Harbor. Justin George of the Sun offers an insightful and interesting look into how a Baltimore Police team probed the Freddie Gray injuries in secret since April 13, an investigation that is ongoing. It’s topped by a video with Justin George. Investigators believe Freddie Gray suffered serious head injuries while he was in a police transport van, although they have not concluded how the injuries occurred, according to a law enforcement official familiar with the investigation. Lynh Bui, Arelis Hernández and Matt Zapotosky report in the Post. The article is topped by a graphic on those charged. Jean Marbella of the Sun writes that State’s Attorney Marilyn Mosby charged the driver of the van with second-degree murder and the other officers with offenses that included involuntary manslaughter, vehicular manslaughter, second-degree assault, false imprisonment and misconduct in office. The officers were taken into custody Friday and released on bail. Legal experts are divided on whether Mosby over-reached, reacted too early or acted appropriately considering the facts, writes Liz Bowie and Michael Dresser in the Sun. Sun staffers offer profiles of each police officer charged. Begin by clicking here and scroll down into the copy. Jackie Northam of National Public Radio profiles Marilyn Mosby, a mother of two daughters who comes from five generations of law enforcement officials, including her mother and father, aunts and uncles. Her grandfather was a founding member of the first association for black police officers in Massachusetts. A Baltimore judge is expected to rule this morning on whether the city must release from custody people who were arrested during last week’s riots and held more than 24 hours before seeing a district court commissioner, reports Steve Lash for the Daily Record. Columnist Barry Rascovar writes in MaryandReporter.com that the roots of this civil unrest in Baltimore City will be analyzed for decades. One obvious flash point could become a bone of contention in the Democratic presidential campaign. Another could dominate next year’s election for mayor. History may record that both Martin O’Malley and Stephanie Rawlings-Blake, mayors past and present, bear partial responsibility for what went wrong in Baltimore over the last week. Baltimore Magazine rounds up a bunch of photos from everywhere about what was happening in Baltimore during the lengthy peaceful times during the past week. Here’s the best two minutes of Meet the Press, where the main topic the unrest in Baltimore with Mayor Stephanie Rawlings-Blake and former Mayor Martin O’Malley — and of course speculation on whether he will run for president now. While the FOP was claiming that State’s Attorney Marilyn Mosby had a conflict of interest, it and David Zurawik, media columnist for the Sun, also point to WBAL-TV’s investigative reporter Jayne Miller, who is in a personal and insider relationship with the top prosecutor in Mosby’s office.